shabby apple, online candy store of women's dresses, asked me to pick a wee treat from their cruise-slash-holiday-getaway line to giveaway to YOU! (that is, you living in north america EDIT: you living in the US of A. sorry canada and world. hopefully shabby apple will rule the international waters soon.) i'm so not into cruises. something abut falling into water and not being able to breathe. but i do like me some holidays. 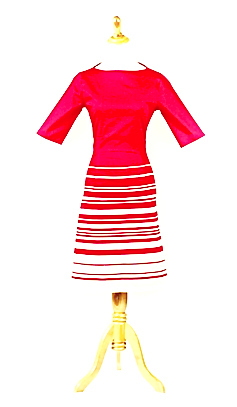 so i chose the bacciami dress because it looks like a candy cane. i'd wear this with green suede pumps and call it a christmas party. 2) for a second chance, follow me, or let me know how you follow me if you already do. you must complete numero uno to enter! following me is optional, but gets you a second entry. and it makes me feel popular. I subscribe to (and LOVE) your blog. I also like candy canes. A lot. I also like SA on Facebook. I have only been able to afford to be inspired by their looks, although I have often wished to own one of their faboo dresses. Yummy. I have liked Shabby Apple and following you with my lovely google reader. Now when do we start drinking the egg nog??! HAhaha! I totally am already subscribed to you! I also liked Shabby Apple's Facebook page. Just liked 'em on FB - and follow you through Google Reader. What a great dress! Like them on Facebook, love you on Google reader. Thanks for the treat! Just liked Shabby Apple on FB and have followed you on my Blogger Dashboard Reading List for a while. OMGah! That is one fantabulous dress!! I already like Shabby Apple on Facebook and am a delighted follower of you, Oona, dahlink! I would wear that awesome dress with my double strap mary janes and some fantastic vintage jewellery! I just "liked" their facebook page just for the chance of looking like a candycane. Total Fun. I like Shabby Apple on FB. I have not had the funds to purchase yet but gorgeous dresses. I follow your blog and love seeing you complete your challenges on Sew Weekly also. Hi - I liked Shabby Apple (actually like them before too but double checked) and I'm following you too. Plus I really like the dress. I like Shabby Apple on fb. Thanks! How fun! Glad I found you. :) I've liked Shabby Apple and followed you. They have some very cute dresses! I love love love Trevi Fountain. The color is fabulous! Oona! You know I have you on my RSS reader! And on my BurdaStyle wall! And I am a member of Sew Weekly. In fact, I'll stop there, less you think I am stalking you! Please put my name in the hat and i'll go like shabby apple they are always inspiring. WANT! I liked Shabby Apple already. Also, I follow you. Obvi. Ooh! I love Shabby Apple and I follow your adventures in sewing, too. Count me in! What a great giveway. I've 'liked' Shabby Apple on FB and follow you as well. I love your posts and look forward to them !! Cool! What a fun giveaway! I've been lusting after Shabby Apple dresses for a while now! Also - I follow your blog through google reader - enjoying it very much! I love that dress so much! I liked SA on FB and added you to my Google Reader (plus on Sew Weekly). I'm following you on my Google Reader and I liked Shabby Apple on FB. LOVE both of you! Ooh la la - I love me a little something fancy and fun 'round the holidays... I also look forward to reading more of what you write - you see we've not met, but the lovely Mrs. Clisset turned me on to your blog. Looking forward!! I "liked" Shabby Apple on their facebook page, and I def follow you in BurdaStyle, and I thought I already followed you... okay, now I definitely do via Blogger! Thanks for running this giveaway and choosing such a cute dress. I love cruises. Of course I follow you! Love your blog! I already liked Shabby Apple on Facebook and I subscribe via Google Reader. Thanks for the giveaway! I follow yo blog gurrl! lol plus candy canes are best when its with a Black Santa: 3/4oz. Kahlua coffee liqueur, 1/4oz. peppermint Schnapps, 1/2oz. vodka, and 1 candy cane dress. Pour vodka and Kahlua into a glass with ice, add peppermint schnapps & candy cane garnish. serve and enjoy! Merry Christmas ALL! I love Shabby Apple and liked them on fb ages ago. I also love YOU, and started following a couple of months ago. I liked SA and I already like you popping up in my RSS. The dress is awesome. I would also like a ticket to NYC and an invitation to come drink tequila with you. Can do? And I've been following you via Google Reader for ages. I love seeing what you come up with! I already follow them on Facebook. And I stalk, *ahem* I MEAN FOLLOW you as well. I like them on Facebook. I would like you as well if you had a Facebook fan page. And I love candy canes! I liked SA on Facebook and already follow your blog. Love your blog! I subscribe and I like Shabby Apple on Facebook! I just followed Shabby Apple on Facebook and I've been following your adventures for awhile now! My friend is friends with the owner's sister, I couldn't believe the connection when I recently asked if she knew about SA. Btw, I love your casual hints of this giveaway in subsequent posts, you are too funny! I've liked Shabby Apple on Facebook. Liked on FB, and added you to my own reader (aka a tab on firefox with sewing blogs I scan daily), since I never bother to open up anything else. hey thanks karen that was GREAT.